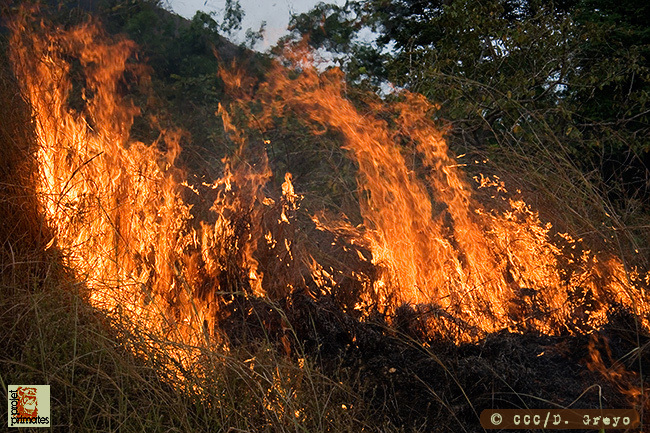 Traditional practices of cultivation (slash and burn): cutting down trees and burning debris, cleared areas are farmed for one to two years after which fertility is depleted and new land put in to production. Depleted land left fallow takes years to regenerate. Commercial Plantations: Extensive areas are taken over to grow cash crops such as palm oil (for biofuel), coffee, cocoa, bananas, etc. These large areas of land, often owned by outside entities, are destroying extensive areas of forests. Exploitation of wood, legal or illegal: the notion of legality remains unfortunately vague and effective control for cutting zones or cut quantities are virtually nonexistent. The illegal logging is an unfortunately common practice in Guinea and in many African countries. It is the result of local individuals, who cut trees haphazardly, or large companies (foreign) who lead mass, total and irreversible, forest destruction. When selective thinning is practiced on a small scale, by individuals only equipped with chainsaws, only large trees are felled. The felling of selected trees allows forests to regenerate as seed dissemination occurs. Clear cutting, practiced by larger companies, results in deserts, which prohibits reproduction of trees and leads to erosion that disrupts the ecosystem on a large scale (lagoon silting, rivers etc.). Large companies also construct logging roads which opens the heart of forests. Previously inaccessible areas become accessible to poaching and bush meat is often transported on logging trucks. Mining, oil and gas operations: also lead to severe environmental degradation. The long-term effects on the environment are many: habitat destruction, soil and water pollution (groundwater, rivers), impact on the geographical operation sites and erosion are just some examples. A direct consequence of commercial forest exploitation (large-scale cultivation, cutting, mining or others) is increased population pressures from an influx of workers and their families. Operation sites, as well as surrounding areas, suffer a direct impact from the exploitation and competition for natural resources for agriculture, hunting, firewood, etc. which contributes to additional forest degradation. Commercial Hunting:intended to supply the bush meat markets (in big cities), to provide “trophies” to big game hunters, souvenirs to tourists, and to service the live animal trade. The illegal export of live exotic animals is a sad reality. Because only a small percentage of animals manage to survive transport, a large number of animals are captured to ensure that a few reach their destination alive. Baby chimpanzees are among the first victims of this kind of trafficking. When shown a baby chimpanzee by a poacher, people are softened by the sight and are then motivated by the intention to buy the chimpanzee in order to “save” the baby’s life. However, buyers often do not reflect on the potential consequences of being a baby chimpanzee. Unfortunately, this activity is lucrative for poachers. 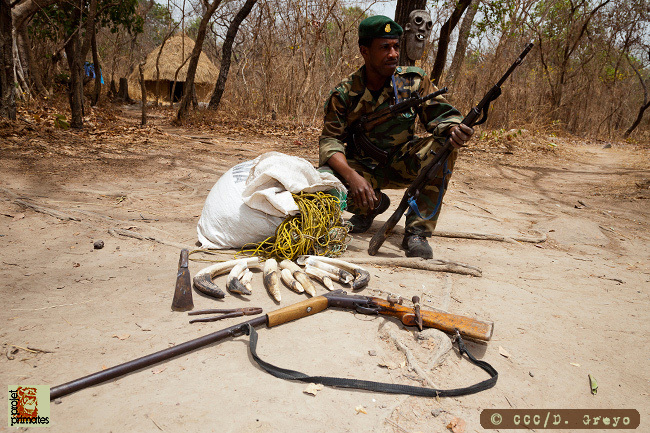 Commercial hunting is often done on a large scale with weapons of war and damage to important and protected wildlife. Chimpanzees are our closest living relative. As a result of this close genetic relatedness, they unfortunately also share a large number of diseases with us. In the past, wild animals were rarely in contact with virulent viruses or bacteria that cause disease in humans. Thus their immune systems are often unable to fight these pathogens. Through loss of habitat, chimpanzees are closer than ever to human populations, which increases risks of transmission. Chimpanzee communities have been decimated by influenza epidemics, pneumonia and other contagious ailments, all of human origin. In Central Africa, there are signs of large populations (especially gorillas) that have been virtually exterminated following the passage of EBOLA virus.